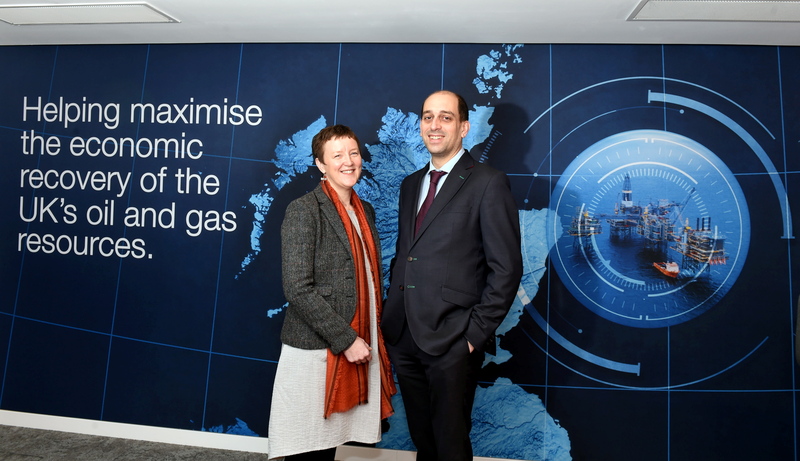 The Oil and Gas Authority's West of Shetland manager, Brenda Wyllie and Nick Richardson, Head of Exploration and New Ventures. The Oil and Gas Authority (OGA) is working to solve an “infrastructure puzzle” for what is considered to be the most prospective region of the UK North Sea. According to the regulator, up to 4.7 billion barrels of oil equivalent are yet to be discovered in the west of Shetland (WoS) area, which is increasingly becoming a focus for major operators. BP, which has sold some assets in other North Sea regions, has increased its stake in the Clair field, WoS, and recently achieved first oil from the Clair Ridge development. In October Equinor struck a deal to acquire Chevron’s working interest in Rosebank, one of the largest undeveloped fields in the North Sea. Meanwhile, the sector looks to projects from the likes of Siccar Point and Hurricane Energy, which is targeting first oil from the Lancaster development. Brenda Wyllie, the west of Shetland area manager at the OGA, said the developments have been encouraging. “West of Shetland remains one of the largest areas of resources both in the exploration plays as well as the discoveries yet to be developed,” she said. “We’ve seen BP bring online Clair Ridge, we’ve also seen them sanction Alligin, which is a tie-back to the Glen Lyon FPSO. Despite these exciting oil projects, a number of gas discoveries have “struggled” to get developed due to a lack of infrastructure. The OGA is working with five companies with prospectivity around Total’s Laggan-Tormore project. Those firms – namely Total, Nexen, Ineos, SSE and Siccar Point – could work together to put more infrastructure in place. The regulator believes this would lead to more discoveries being developed. Ms Wyllie said: “There are two (types of) plays west of Shetland, you’ve got oil plays which are the typical BP-type operator assets, as well as Premier with the Solan and Hurricane with their Lancaster. But there are also gas discoveries out there and those have really struggled to get developed, simply because of the infrastructure. “So under the MER UK strategy and the concept of area plans, we’re working with operators who naturally cluster with some prospectivity and potentially discoveries to work together to unlock that gas infrastructure, in order to get those discoveries into development and that has been a key part of the OGA’s work over the last couple of years. “Getting the gas away is infrastructure-driven and we think by working together we can help to unlock that infrastructure puzzle. “You’re always looking for that critical mass to instigate an infrastructure build – a pipeline basically. “There’s plenty of gas handling. We’ve got the Sullom Voe Terminal and next to it the Shetland Gas Plant, and there’s plenty of access to St Fergus. “It’s just to get some of the infrastructure to that northern area, or indeed to other areas west of Shetland that would probably need that instigator. Individual operators may not see the full picture, and may not know what neighbouring firms are up to, but the OGA is in the unique position of having dialogue with each one and is facilitating talks. “We naturally have that better oversight to bring to the table some of the key contributors in an area and encourage them to talk and collaborate,” Ms Wyllie said. “We can just see it slightly wider and if other licences get taken in future rounds which also contribute to that area, then we can bring those operators to the table too. So it is an evolving group. “The talks have been really well received by the operators, we feel like we’re pushing on an open door here. The OGA’s 30th licensing round last year saw several awards picked up west of Shetland by the likes of Total, Shell and Chrysaor, to name a few. It comes as operators’ understanding of the region improves with increased use of seismic data which the regulator said was an encouraging development. Total in September discovered the Glendronach reservoir, which could pump out 1 trillion cubic feet of gas, and is considered to be a world-class discovery. The OGA said this was a good example of firms using data to scope out prospects in deeper water. Nick Richardson, the OGA’s exploration and new ventures manager, said: “We’re seeing that companies are looking at deeper stratigraphic intervals. “Previously they were looking at shallower targets but now they are looking at deeper targets. “Glendronach is a good example of this, where Total has made a discovery in the cretaceous which hasn’t been explored to its full potential, and now other companies are looking at the larger trend so they can then go and pick that up and expand the volumes that have been discovered. This comes as the OGA prepares to launch the UK’s first National Data Repository early this year, which will house and publish a collection of petroleum-related information. “I think the data repository is critical really,” added Mr Richardson. “We’ve had many, many companies asking us for more open access to data which then allows ideas generation, not just larger companies but smaller firms, and individuals and universities. As well as subsurface, the development of technology could play a starring role in engineering with the aforementioned infrastructure issue for gas discoveries. Ms Wyllie said: “When we talked about that northern hub, there’s a real potential for subsea technology to help unlock that area. “Where the water depths don’t lend themselves to a platform being in place and you now go subsea for some tie-backs, is there gas processing? While many regions of the North Sea typically report smaller discoveries these days which are tied back to existing infrastructure, frontier regions need a different approach to meet a different set of challenges which will involve the use of technology on all fronts. Mr Richardson said: “There are certainly different maturity levels, and therefore you need to have different company strategies to exploit them. “If you look at the more mature areas, with the Beryl area for example with what Apache has been doing – they have had great success in exploring for smaller volumes and then tying them back into their existing infrastructure. Although not as old as other parts of the North Sea, the region still has some anniversaries to celebrate. The Sullom Voe Terminal recently marked 40 years since the first oil was brought there. The facility was operated by BP until December 2017, at which point EnQuest took on responsibility. It comes as the OGA has been pushing the importance of Shetland, recently hosting an event to showcase the supply chain there and the work it can bid for. Ms Wyllie said: “Oil from the Clair development comes into the Sullom Voe Terminal, which just celebrated its 40th birthday. It was put in place for a 25-year lifespan and here she is at 40.